Glioma is one of the most common types of primary brain tumors and can occur in the brain and spinal cord. 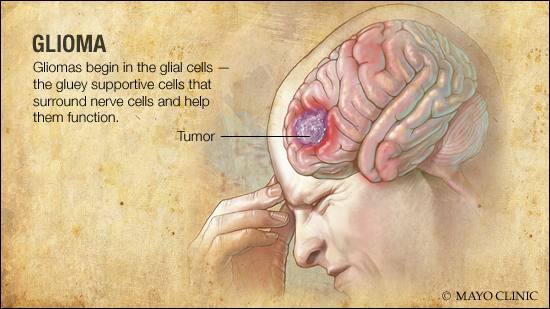 Gliomas begin in the glial cells — the gluey supportive cells that surround nerve cells and help them function. A glioma can affect your brain function and be life-threatening, depending on its location and rate of growth. Learn about the risk factors and symptoms of gliomas, and when you need to seek medical care. Almost half of all men and one-third of all women in the U.S. will be diagnosed with cancer at some time in their lives. A cancer diagnosis often comes with little warning. Here, Dr. Edward Creagan, a Mayo Clinic oncologist, offers his advice on what to expect and how to cope after a cancer diagnosis. Once your health care provider has diagnosed your mouth cancer and determined the stage, treatment decisions will be made. Treatment for mouth cancer depends on the location and stage, as well as your overall health and personal preferences. Treatment options include surgery, radiation and chemotherapy — alone or in combination. Learn more about these treatment options for mouth cancer and which might be right for you.